Jessie was an amazing person. She was of course very talented at chess and many of her friends, from all corners of the globe, met her through the large ‘chess network’. 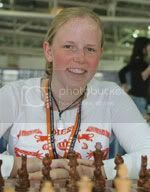 Jessie was one of England’s leading women players and had most recently represented her country in the national women’s team on board 2 in the chess Olympiads in Turin, 20th May – 5th June. Although her team debut had only been in August last year for the European Team Championships in Gothenburg, she was already a much valued and respected member of the team. She also represented England in the European Individual Women’s Championships in Turkey in April, 2006, where her fine performance earned her the final of three norms for the Women’s International Master title. Still a junior internationally, she has represented England every year at World or European Girls’ Championships since she was 12, in 2001 winning the bronze medal in the European Girls’ Under 14 Championship. She first came to prominence when she won the Women’s World Amateur Championship aged just 12, the youngest player ever to do so. Jessie was fundamentally very talented. However, the qualities that set her apart as an individual from so many others, are those identified in the comments below and to which it is hard to even begin to put into words. However, to make an attempt, Jessie was loving, kind, caring, inspiring, courteous, modest, self-effacing, warm, gentle, helpful, loyal, fun… truly a wonderful girl who will be truly missed. Please feel free to leave comments below – they are of much comfort to all who loved her and serve as a fitting tribute to Jessie. I miss you so much and feel incredibly sad that you are not here to enjoy the happy life you deserved. We are all doing our utmost to live our lives for you, and you are always in our hearts. During your short life you created an enormous amount of love and positivity in the world, and it is a better place for having been blessed with you. Thinking of you today and everyday Jessie. Thank you for your kind remarks. I still think about Jessie every month or so. I don’t always remember 26th July, but I am pleased that I have done so this year. Dear Harriet, David and everyone else who misses Jessie, thank you so much for remembering her, as well as for looking after her when she was here. It is such a great comfort to know that my beloved daughter was cared for by so many, and that she lives still in your hearts. I don’t know if Angela and the family are still reading this, but I wanted to say I am thinking of Jessie and all of you once more today. On the tenth anniversary of that tragic day, I wanted to let you know that you are not forgotten. May you continue to rest in peace.